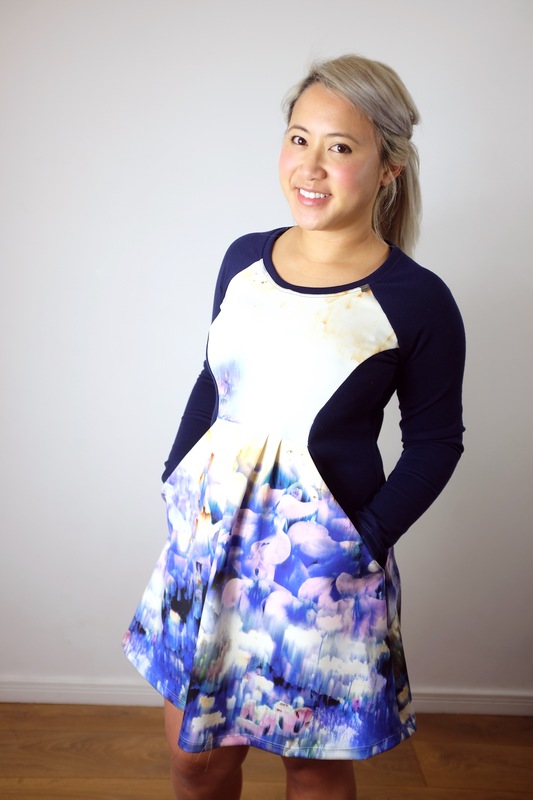 The Zadie is an empire waisted dress designed for knits with multiple options for sleeves. It has a separate side panel feature that allows for easy colour blocking. I was really drawn to the style lines of this dress. I liked how the pockets are attached and are part of the side bodice panel. I have to say I was not a fan the sample garment on the front of the pattern (though I know a lot of people do from the sounds of those kit sales!). Well, the one with the long sleeves anyway – the stripe with that teal and pink. The cap sleeve version is definitely it’s saving grace! I decided to make a long sleeve version regardless. Mostly because it’s freakin’ cold outside and I had the best fabric for a nice thick, cosy one. So I opted for a combo of a navy blue ponte knit and a digital floral print scuba for my colour blocking. I’d had the scuba for ages – loved the print but I couldn’t find the right project for it. This seemed a perfect match! The pattern is a little more complicated than Tilly’s usual fare. That’s definitely a good thing in my opinion. As much as I love the simple Cleos etc, I like learning new sewing techniques and trying harder patterns. This was a fun project to sew. There was a lot of checking back with the instructions to make sure I was getting those panels together correctly but otherwise the dress came together quite easily. I love sewing with ponte and scuba fabrics. They just seem to go through my machine so well. My version isn’t so neat on the sides as I didn’t take the time to match up my points perfectly (naughty me!). The good points – the raglan fits really well on me. Like really well. I like the shape of the front and back bodice pieces too. They definitely add a lot of interest. It also looks and feels a bit like a skater dress. I don’t know if it’s by design or just the jersey that I used but I really get (and like) that vibe. The bad – That empire waist. 😧. Not for me at all. I do prefer dresses that go in at my natural waist. I’m lucky in that I’m quite short and I have a disproportionately short torso as well so it’s almost at my waist anyway especially when belted like this! Without the belt, it makes me look a lot bigger than I am especially in profile. I think to some degree that is due to the weight of the scuba with those pleats weighting and pulling the skirt forwards. It’s something to take into consideration when you’re picking your fabric! I think I’d increase the length of the bodice pieces by an inch or so if I remake this. Empire waists tend to flare out just above my skinniest point so I’d prefer if this came down to my waist proper. Something to work on for next time! I’ve seen a few versions of this new pattern around and love yours! It’s color blocked, and it has a cool print and it looks great on you. 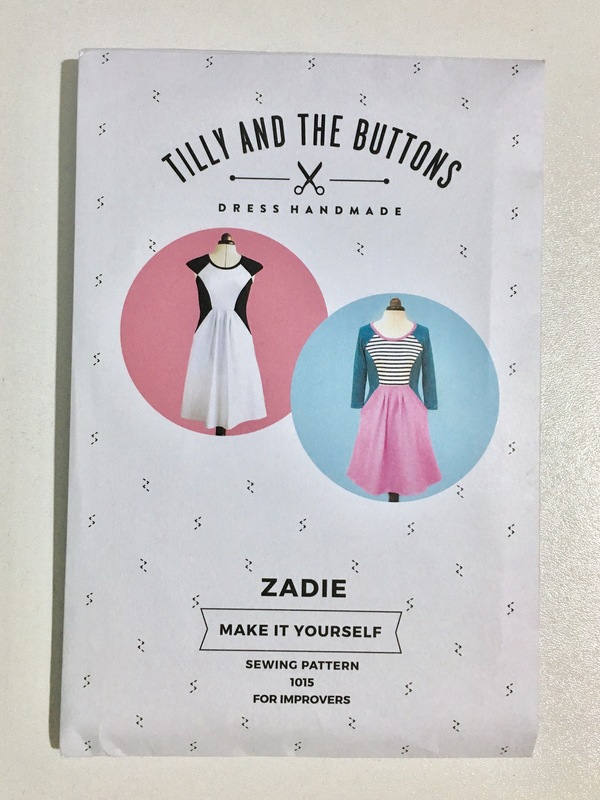 I think I’m going to have to give the Zadie a try! Thanks! I think we’re going to be seeing a lot more Zadie in the near future! I thought the dress was totally great and fits you well until that side view. It really is awkward isn’t it? Just don’t let anyone see you from the side! lol I really love those pockets on the front. It’s the thing that caught my eye and I agree the weird stripey one is not appealing on the package. Lol. It definitely needs to stay belted on me! The pockets are def my favourite thing – though to be fair I love pockets on everything! Ooo, try a Tilly pattern at some point. They’re some of my favourites amongst the indie companies. Simple in design and more beginner based but the patterns and instructions really are very good. I hear you on the empire line. I have a super-long torso, so anything I buy in a shop tends to be an unintentional empire – it’s not a look for my body shape. It looks nice with the belt though, so I’m glad you’ve found a way to make it work! After much deliberation, I think the colours of the long sleeved one on the cover remind me a bit of a child’s princess costume, which is just too cutesy for me. Haha! Yeah it does come across a bit costumey. I think the colours are what Anna from Frozen wears!! This looks great! Would be interested in how to hack this to move to a natural waist as I really don’t find empire flattering on me. It’s definitely something I want to work on! Lucky there are belts to solve problems. The fabric combinations are great and suits you well. I agree with you and think that this dress works better with a natural waistline. Thanks! Belts to the rescue for sure in this case! Loving the digital print! Empire waist is tricky. I always belt them like you had.